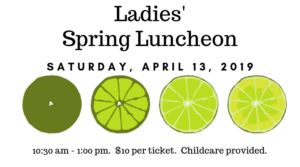 Ladies' Spring Luncheon Saturday, April 13, 2019 10:30 am - 1:00 pm in the Fellowship Hall Join us for fellowship, a delicious brunch, games, a discussion panel on sisterhood, presentation of the gospel, door prizes, signing, and more! Childcare is provided. Sign-up at the Connection Point before April 7, 2019 $10 per ticket.